Pesto is one of those things that too often gets relegated to one application: pasta. But there’s so much more pesto can do! 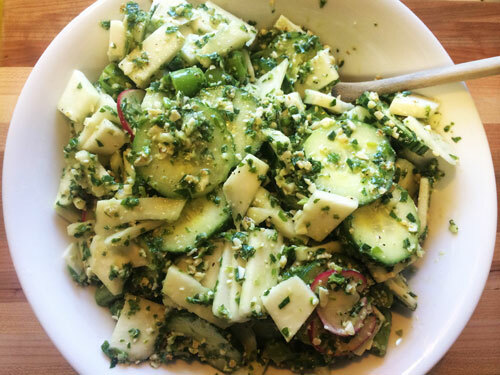 Here it acts as a flavor-packed “dressing” of sorts to any kind of fresh vegetables you have on hand, creating an amazing salad. If you don’t have spinach for the pesto, try this with arugula, radish leaf, or just use the basil. For the nuts, I love walnuts in a pesto (cheaper than pine nuts, and I just like the flavor better). But you can try pine nuts, toasted almonds, hazelnuts, or your other favorite nuts. Slice cucumbers into thin rounds, and chop or slice your other fresh vegetables. Put all in a large bowl. In a food processor, add the spinach, basil, garlic, nuts, and cheese, and pulse until well-combined, opening the processor occasionally and using a spatula to scrape the sides. Add olive oil, lemon juice, and salt, and pulse a few more times. Add pesto mixture and pepper to your veggies and use a spatula to stir until well-combined. Serve cool.